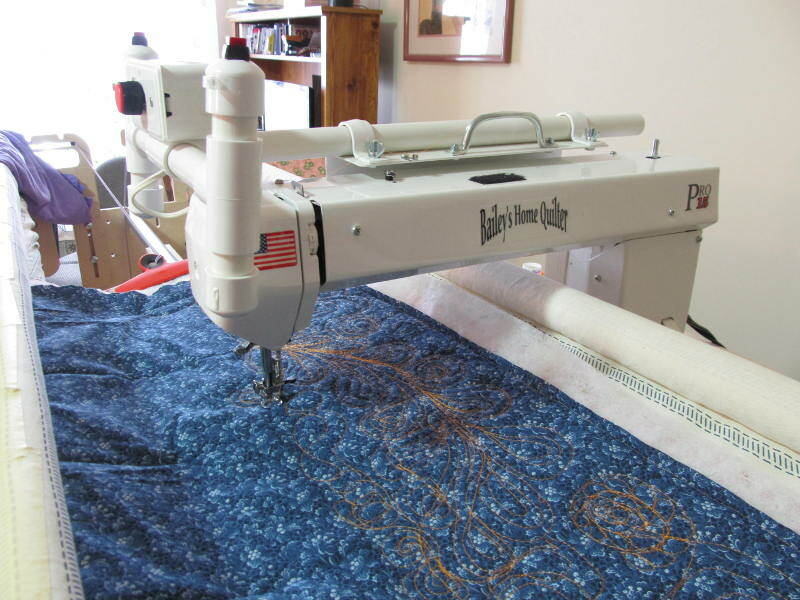 Well.... one of my friends from my quilt guild bought a longarm recently and she pushed me to get started on my Bailey. We tried about 2 weeks ago but while adjusting the screw on the bobbin case, the screw flew out and has not been seen since. I ordered a new case and got it in last week. Today Jen came over and we got my Bailey up and running. It took a bit of fidgeting to figure out how to thread it since the "manual" it comes with is just worthless and a joke. but after a bit I was quilting!!! I have to take apart my frame and put it together right (long story, let's just say we have it rigged to work right now lol) and lower it about 3" so I don't get strain so quickly... but I do believe that I might keep this beast even if she is sucking up a huge chunk of my new craft room. At least now I'm not looking at her thinking she's a space hog. Now I am looking at her thinking that she ain't all that bad and I'm pretty good at it. You will love the Bailey. I have one also. I quilted a quilt today. Yay, keep practicing. From what I can see, you are doing great. So glad you are using it, no sense having a quilter and not using it. Enjoy. I know what you meant by being afraid of it. I'm still leary of the Avante, but I use it. FMQ scares me to death, but I would really love to be able to do the beautiful feathers that others do. I can SID, meander, and follow pattern boards or templates but not pantos. Enjoy your machine! Happy quilting to you! Hooray for you mastering the beast! Just think of all the storage space you are going to free up when you have all your UFO's quilted! Good for you, glad it's working out. We will all look forward to seeing a quilt quiltedy by you. It is actually a Superquilter Proflex frame. It has 10' poles. My old craft room was pretty much 11' square so it was up against a wall. My new craft room is muuuuch larger and I can get behind and around it without any issues at all. I like the proflex frame but then I have nothing to compare it to. I think once I get the hang of it, I'll be pretty happy. Sure I would have loved to buy a $6000 - $10,000 model but I just don't have that kind of cash. The Bailey is a workhorse with a pretty big following. I do wish that they would do something with the manual though. It is downright sad. It took two of us to figure out how to assemble the bobbin assembly area and to thread it - and I have to say that I'm still not 100% sure if I have it threaded right but it's working after 3 or 4 hours of trying everything we could think of to get it to work. Yay for you! Have fun. Conquer the Bailey and show her who's boss. So glad that you are using your Bailey! Keep posting pics for us to enjoy. Yarn or Fabric: Do you belong to the Bailey's qulting forum? The claim to have lot of videos on there to show you how to do everything. I joined it when I was thinking of getting a Bailey but I never did get one! well look at you go! How fun! I do belong to the group but I can't find any videos about the machine at all - other than a handful on youtube. None of them showed how to thread the machine which irritated me to no end. The "manual" has a REALLY bad picture in it about threading it and it's hard to tell how to do it. Is there anything better than conquering a fear... !? Have FUN! How much does a Bailey cost? I've been wanting a long arm machine but don't have $6000. I thought that's how much they all cost. Is Bailey a reasonably priced machine? Looks like you've got the hang of it! Congrats! You did great. What fun to be able to use a machine you have and learn to love it. I was the same way when I first got my LA. Scared silly of it and why is beyond me. So glad you are making friends with your Bailey. Quilting is so much fun! The Bailey videos can be found on YouTube. Here is the link to the one about maintaining the bobbin area http://www.youtube.com/watch?v=jdUpNE5wxoQ Debbie has several videos on YouTube. I have had a Bailey for years and I love it. The Baileys are reasonably priced. They have some specials on classroom models through their website. You can also pick them up used through the yahoogroup. Here is the one that I have - the 15 http://www.baileyssewingcenter.com/bahoqupro15.html The price depends on what kind of frame you have. I had purchased the frame first then got a machine to put it on. In hindsight, a package deal would have been a much better route to take but it's all done now. Can't go back. I didn't get to use it today :'( I had a lot of errands to do today and was gone for most of the day. I will get back on it tomorrow though.